Tom Marioni is a San Francisco first generation conceptual artist and sculptor originally from Cincinnati, Ohio. His exhibition at Carl Solway Gallery will include new dry frescos, two site-specific wall drawings, a blown glass cigar ashtray and a selection of bronze sculptures. Marioni created the dry frescos by attaching graphite to a piece of bamboo and using it as a drawing instrument. 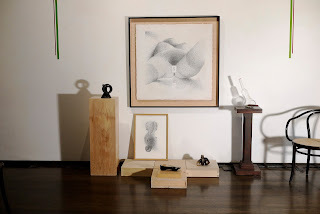 In tapping against the fresco surface, he uses the graphite as a percussion instrument, much as he has done since 1972 with his ongoing series of “drum brush drawings”. In this work, he leaves metal marks by drumming with jazz drummers’ steel wire brushes against large sheets of sandpaper. The visual record of this action results in a marriage of visual art and music. His new fresco drawings, a departure for Marioni, are figurative in nature and relate to San Francisco’s figurative movement of the 1950s. Marioni’s conceptual performances of the 1970s were about body measurement and this concern will be evident in his site-specific wall drawings titled Out of Body Free Hand Circle (on prepared wall). These drawings relate to Drawing a Line as Far as I can Reach from 1972. The bronze sculptures are more abstract, but also relate to the body. As a conceptual artist, Tom Marioni allows specific ideas to dictate the medium for each artwork. Many of his pieces presage artists today who use sound, duration and social interaction as subjects. He is best known for his social artwork, The Act of Drinking Beer with Friends is the Highest Form of Art, introduced in 1970 and repeated in various contexts internationally. In 1970 he established the Museum of Conceptual Art (MOCA), which functioned as an alternative space, providing a forum for artists to explore the then-new genres of performance and installation art. He organized many groundbreaking shows there until the museum closed in 1984. Marioni’s installation/performance works have been presented at the Whitechapel Gallery in London (1972), the Institute of Contemporary Art in London (1973), the Centre Georges Pompidou in Paris (1980), and the Folkwang Museum in Essen, Germany (1982) among other institutions. He has produced sound works for radio stations KPFA in Berkeley and WDR in Cologne, Germany. In 1996 he organized The Art Orchestra and the group performed at the Legion of Honor Museum in San Francisco. Marioni was included in For Eyes and Ears (1980) at the Academy of Fine Arts in Berlin, Live to Air (1982) at the Tate Gallery in London, and From Sound to Image (1985) at the Stuttgart Staatsgalerie in Germany. His work was shown in Out of Actions: Between Performance and the Object (1998) at the Museum of Contemporary Art in Los Angeles, and The Third Mind: American Artists Contemplate Asia (2009) at the Guggenheim Museum in New York City. 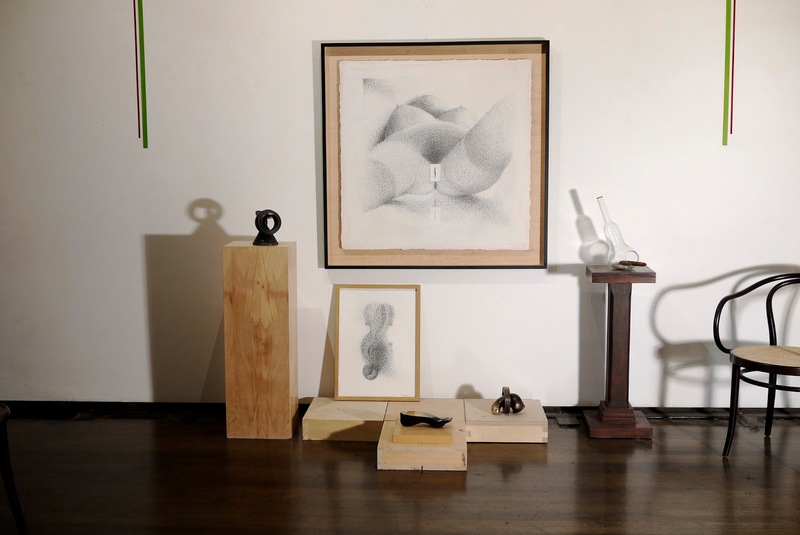 Drawing is central to Marioni’s art, and in 1999 the Mills College Art Museum in Oakland presented a drawing retrospective. In 2006 the Contemporary Arts Center in Cincinnati exhibited a survey of his work. Marioni is the author of Beer, Art and Philosophy, 2003, a memoir, also Writings on Art 1969-1999 and Fabliaux Tom Marioni Fairy Tales. Tom Marioni received a Guggenheim Fellowship in 1981 and three grants from the National Endowment for the Arts during the 1970s. His work is in the collections of the San Francisco Museum of Modern Art, the Museum of Modern Art in New York, the Stadtische Kunsthalle in Mannheim, Germany, the Centre Georges Pompidou in Paris and numerous other museums. He was born in Cincinnati in 1937 and attended the Art Academy of Cincinnati. He moved to San Francisco in 1959. Elsa Hansen creates deceptively simple cross-stitch embroidery pieces on fabric. Her embroidered figures often depict provocative comparisons of public and religious figures, offering an unexpected take on popular events, politics and society. Cross-stitch embroidery flourished during the Tang dynasty (618-906 AD) in China and spread via trade routes through the Middle East, Africa and Europe. In its most elaborate form, including the famed Bayeux Tapestry, embroidery became a device for storytelling. Imbuing the technique with a minimal, stripped-down aesthetic and portraying contemporary figures, she intertwines tradition and pop culture. Hansen took up cross-stitching while collaborating on film projects. It was a way to fill time during the editing process. She experimented with various designs until she came across Minipops, small pixelated drawings of famous people created by the British artist Craig Robinson. At first inspired by the figures found on his hit cult website, she realized that pixels translated directly to cross-stitching and began to create her own cast of characters. The rest of the dial is in the iconic replica watches uk white “polar” color with cardinal markers and hour markers (round), also with a black painted outline, completing the unique – and replica watches uniquely legible – maxi-dial. While clearly remaining a Rolex with the classic oyster case, the cyclops on the crystal, and the famous Rolex dial, this model is less common than the rolex replica uk Submariner and GMT Master II, easily making it the more interesting Rolex if you want a solid sports watch from the famous brand – and hence it is one replica watches that you will more rarely see anyone else wearing during the day. As a matter of fact, during my entire time traveling to China, I only spotted one other person wearing a Rolex Explorer II (black dial), rolex replica though I spotted countless other Rolex sports watches.